Antique black has always been my background colour of choice. So getting this light background right has been a new adventure. I searched through my dye collection again, to see what I could come up with for the new (green only) background colours. 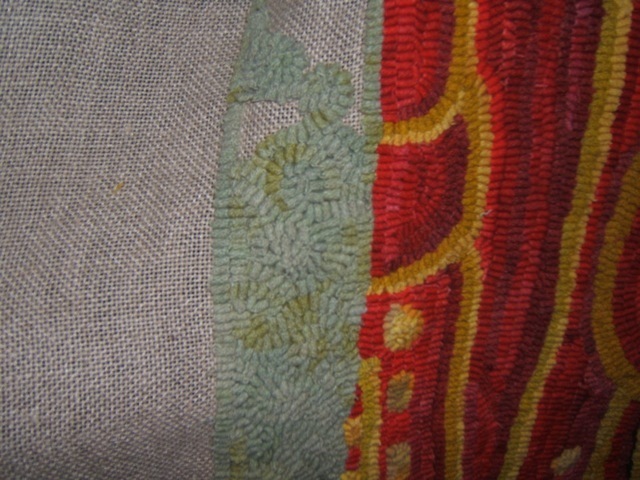 I chose the Cushings ‘mint’ I had used before, Majjic Carpet ‘moss green’, and Prochem ‘drab olive’. 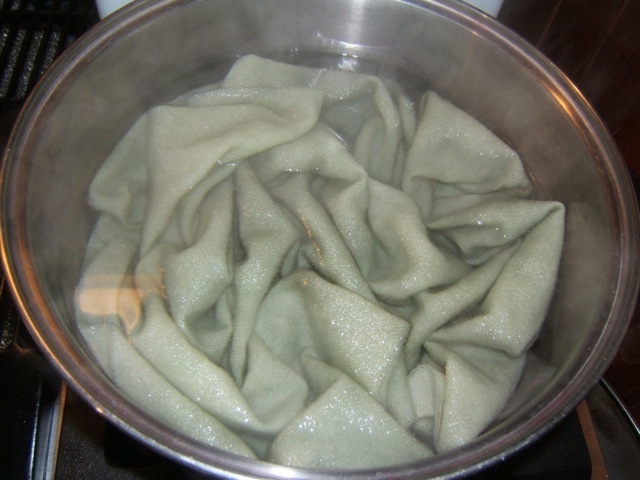 I used 1/2 yard Dorr natural, and 1/2 yard oatmeal (each torn in half ). This time I decided to dye each piece separately and each with just one colour. I used 1/64th tsp of dye in 1 CBW for each 1/4 yard piece, putting 1/2 of the dye bath in the pan, and spooning 1/2 over the wool for the mottled effect I like. I did the moss green and drab olive over the natural wool, and the oatmeal wool I did with the mint and drab olive dyes. It was interesting that when the drab olive dried, it was way too light (really just off white) , so I re-dyed it using another 1/64th tsp of drab olive. This time it definitely has blue in it….I think I can still use it, but the blue isn’t noticable on the oatmeal piece that was died with drab olive. The small bits of background showing through the ribbons, I decided to try with just one colour (moss green), and I like the way it pops the reds out. Then I thought it was too much contrast with the rest of the background, so I took parts of it out, and did it with several colours of gree…..that was just nasty!…so I rehooked it with the light green. I will have to do a gradual transition to the mottled background. 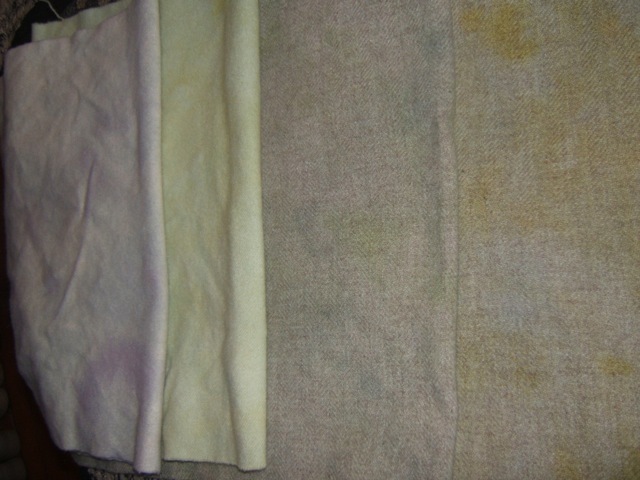 The dip dye I’ve used at the border also doesn’t work….so that will be replaced. I feel that I’m doing more reverse hooking than regular hooking right now, until I get this background settled. …but the fact is ….I don’t like it either. I don’t think it enhances the main hooking, and it draws my eye to it far too much. It is also sadly far too much like what I disparagingly call…’public washroom green’. I want something that enhances the figure, but doesn’t call attention to itself. How I wish I had an ‘artistic eye’, that could envision these things in advance! Rather than pull anything out at this point, I decided to try just the colours dyed over the oatmeal…they are much duller and more subtle than those dyed over the Dorr natural. 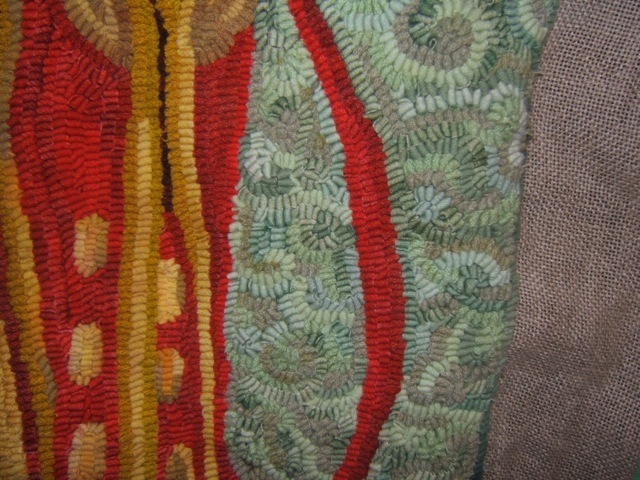 The Quilt and Rug Fair is coming up quickly,(September 17th) so I spent a day hooking more ‘proddy pins’. The Sunshine Rug hookers are selling them , and we’re each asked to donate some since this is our main money making event for the year. I’d like to provide a dozen to sell, plus a few to keep to give away as gifts. I don’t mind making them, but I’m not fond of the finishing (surprise surprise). Since I’m temporarily halted with Hygieia, I have no excuses for leaving them undone! 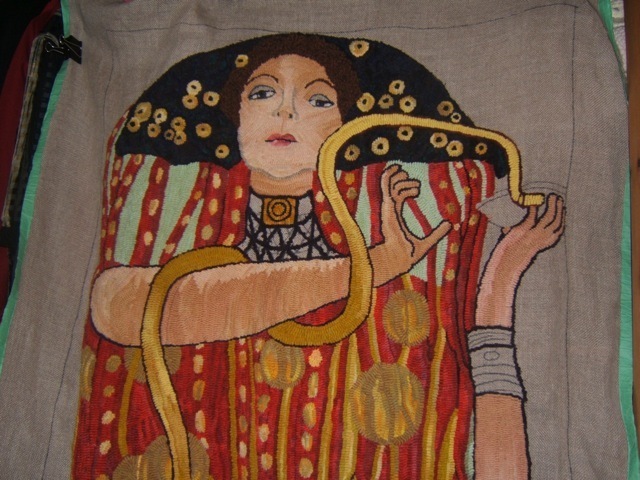 This entry was posted in backgrounds, choosing colours, dyeing techniques and recipes, Hygieia, Klimt, proddy, Quilt and Rug Fair by elizabethmartel. Bookmark the permalink.